Daniel Flott (pictured at left) was born on July 7, 1835 in Cumberland County, Pennsylvania. His parents were John and Mary (Rambo) Flott (in military records "Flott" sometimes became "Flatt"). In the 1850s, the Flott family resettled to Illinois. John David Rambo was Daniel Flott's first cousin. He was born in Adams County, Pennsylvania, on August 24, 1841. His parents were George D. & Mary (Flott) Rambo, who also moved west to Illinois from Pennsylvania. Albert Eads enrolled the two cousins, Daniel and John, for military service on September 20, 1861 at Knoxville, Knox County, Illinois. Eads' enrollees soon traveled to Camp Douglas for training and to join one of the regiments in the process of organization there. In the upshot, at the end of 1861, Eads' Knox County contingent of enlistees was joined to Nathaniel Petts' larger Iroquois County contingent to form Company C of the Fifty-First Illinois. Though John was occasionally sick with dysentery and away from the regiment, both he and Daniel fared comparatively well in terms of general well-being. There is no record of Daniel's being away from the regiment on account of illness, and both of them came through the arduous duty and gunfire dangers of New Madrid, Island No. 10, the Siege of Corinth, protecting the Memphis & Charleston Railroad through Northern Alabama, and the Battles of Stones River, Chickamauga, and Missionary Ridge without serious wounds. In December, 1863, both Daniel Flott and John Rambo, along with many many other members of the regiment, reenlisted in the Fifty-First Illinois. In February and March, 1864, the Fifty-First returned to Illinois on its 30-day reenlistment furlough. Daniel and John returned to Knox County to visit friends and family. At the same time, officers of the regiment engaged in a recruiting drive to fill up the regiment's rolls, diminished by death and illness, again. Albert Eads was again the recruiting officer in Knox County. John's brother and Daniel's cousin, George W. Rambo, enlisted in Company C during this 1864 recruiting effort. George was born in April, 1845 in Adams County, Pennsylvania. He signed his papers in Knoxville on February 24, giving his age as 18 years, 10 months. John signed as witness for his brother's enrollment. The three, with the rest of the regiment, went to the front in northwestern Georgia together, departing Chicago on March 28. The toil and threat of the Georgia campaign of 1864, under General William T. Sherman, began in April. On May 1, 1864, Daniel was promoted to corporal. On May 20, the regiment suffered its first battle fatalities of the campaign. On June 27, 1864, under Sherman's idiot orders, the Fifty-First Illinois and numerous other regiments attacked the Confederate fortifications above them on Kennesaw Mountain. The results were predictable—heavy casualties in the attacking Federal forces, little ground gained, nothing accomplished, Sherman in denial, blaming others for his deadly mistake. The casualties in the Flott-Rambo lineage were heavy. Daniel Flott was killed outright; George Rambo was severely wounded, shot through the thigh and abdomen, and died three days later in the field hospital at Big Shanty, Georgia. 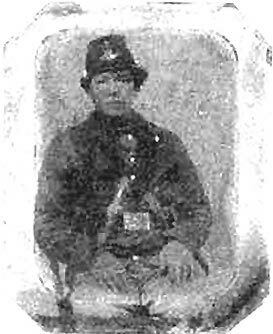 John Rambo, without his brother, without his cousin, served on with the regiment to its last day in September, 1865. He was commissioned second lieutenant but mustered out as sergeant—before official muster as lieutenant. After the war, he returned to Illinois as a farmer. He married Swedish-born Anna Nelson on October 3, 1867 in Knox County, Illinois. John and Anna raised a large family. In the 1880s or 1890s the family resettled to Missouri where John continued to farm. John lived to the age of 82. He died in Lowry City, Missouri on August 28, 1923 and was buried in the Lowry City Cemetery. Anna died on June 5, 1929. Thanks to Teresa Delikat for the photograph and information on the Flott-Rambo cousins. There is a wealth of information on the Flott and related lineages at Ms. Delikat's http://www.flottgenealogy.com/. Daniel Flott, Compiled Service Record, Records of the Adjutant General's Office, 1780's-1917, Record Group 94, National Archives and Records Administration, Washington, D.C.
George Rambo, Compiled Service Record, Records of the Adjutant General's Office, 1780's-1917, Record Group 94, National Archives and Records Administration, Washington, D.C.
Regimental Hospital Records, Records of the Adjutant General's Office, 1780's-1917, Record Group 94, National Archives and Records Administration, Washington, D.C.
Missouri State Archives, Missouri Death Certificates, 1910 – 1957: http://www.sos.mo.gov/archives/resources/deathcertificates/.